MyoGREENS packs 16 of the most potent super greens known to man into every serving. The ultra concentrated extracts are so nutrient dense that just one serving of MyoGREENS is equivalent to over 5 of your '5 a day'! MyoGREENS V2 is absolutely packed with super green goodness. 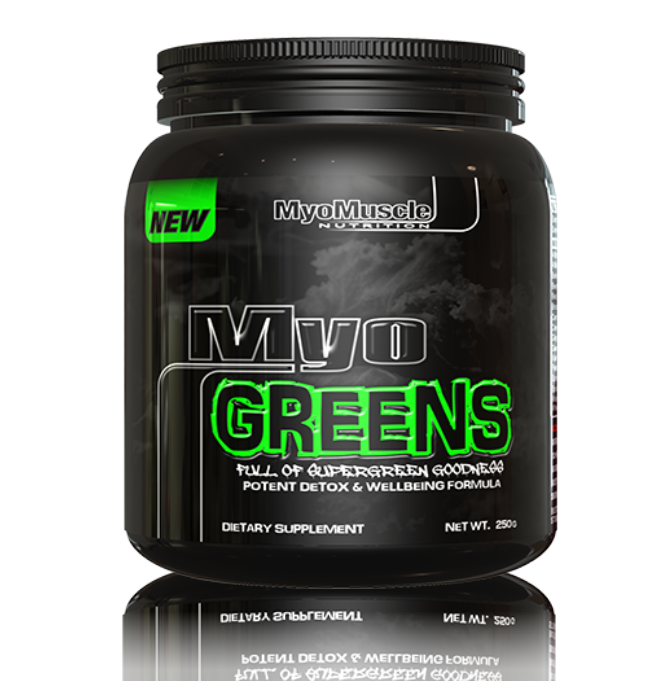 MyoGREENS V2 contains concentrated extracts of 16 naturally nutrient rich, super greens to deliver a nutrient dense mix! 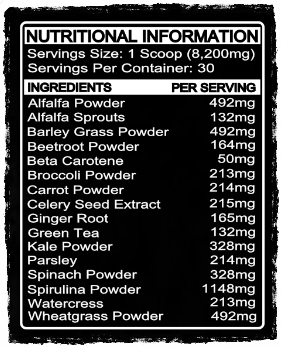 Every serving contains clinically researched and proven doses of: Alfalfa Powder, Alfalfa Sprouts, Barley Grass Powder, Beetroot Powder, Beta Carotene, Broccoli Powder, Carrot Powder, Celery Seed Extract, Ginger Root, Green Tea, Kale Powder, Parsley, Spinach Powder, Spirulina Powder, Watercress and Wheatgrass! Unlike a lot of companies we haven't hidden the ingredients or molested MyoGREENS V2 with flavourings, dyes and sugars. Why would we? We never set out to make the best tasting drink, we set out to make one of the most nutrient dense products available which is packed full of: vitamins, minerals and antioxidants known to improve immune function and overall health and well-being! Due to the highly concentrated ingredients found in MyoGREENS V2 just 1 serving provides all the greeny goodness you need! Now there's no excuse not to get your '5 a day' - everyday! Staying strong and healthy has never been easier. Mix MyoGREENS V2 in a shaker, add it to food, or blitz it in a blender with your smoothies and your done!